These days we are much more likely to want to transfer data from one GPS unit to another, or to a totally different device. 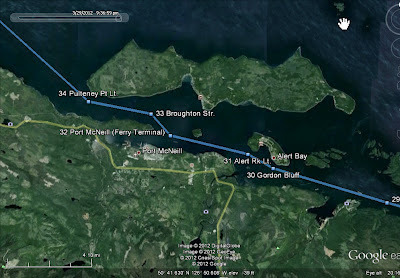 We may take a boat or bike trip and accumulate a neat detailed track history of the trip, showing every detour, along with speed made good at each point, and then want to show friends what it looks like on, say, Google Earth. Or we may just have done well in a yacht race and we want to save our track and wind conditions to study next year or to pass on to others to learn the route. Often you will see very nice lifts and headers and points or headlands or an opening into another waterway. Sometimes these wind behaviors are reproducible, so you can count on it… say, hypothetically, beating to the north you will get knocked as you approach Johnson Point, etc. Another example is you lay out a detailed route in your PC echart program at home and then want to transfer this to the ship’s GPS unit as well as to a couple handhelds on board as a back up. In the old days, this was a rather tedious process, with many pitfalls in protocol along the way. Now there are several easy ways and the simplest seems to be the gpx format, called GPS exchange. Most devices and software are using this, as are as various online services. After making your route, look for an Export option on the device, and then decide what you are exporting. It could be waypoints, routes, or tracks, or all of the above at once. Then you will choose a name and place to save the file, which will be a text (xml) file with extension, ie mywaypoints.gpx. Sometimes you do not get to choose the name, so there is obvious virtue in practicing. Recall, too, that routes and waypoints are well defined, that is waypoints are a list of lat-lon positions, with a name and number attached, and routes are a sequence of such waypoints. These waypoints and routes are each made from points that you personally selected, named and saved. Tracks on the other hand are the history of where you were — the bread crumb trail of your travels. Without getting into the nuts and bolts of the set-up and procedures of your program, you do not know how many points are saved. You could end up with many thousands of points over a longish trip with frequent records, or you may have set up the track recording to store a position every 5 minutes, or every 1 hour, or whatever. Some units let you set tracks by distance, such as every 1 mile, or 100 yards, or 10 miles, etc. Some systems also compact the data for you automatically. They could for example, average every 10 data points to make just 1 after reaching some limit on data storage. In short, the saving and transferring of tracks is not so transparent, but in one form or the other you are getting a record of your actual track across the chart, but once transferred into another device you will not be able to uncompact it as you might on the original device. 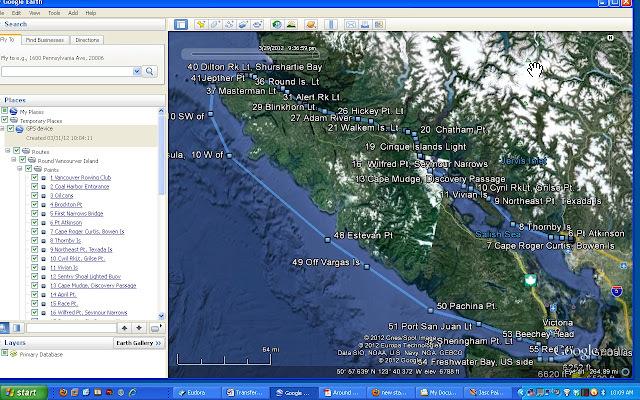 Note this sample route is not for navigation, since it is made with way outdated Canadian echarts. We will remove this statement if we get new charts. Don’t navigate with this placemat! In fact, don’t navigate with this under any circumstances, because every one should make their own routes choosing their own waypoints. Choosing the proper waypoints and then following them is the key to good navigation. The practice we often see of making and selling books of waypoints is a hazard and should be avoided. With all that said, for practice, download the file to your computer, then open GE, then drag and drop onto the page. Put a check mark in all three boxes if GE asks. Then this will be saved in your temp places on GE. If you like you can then send these GE (klm) links to a friend to view as well. See GE instructions. This is just a rough outline of a route. As a rule, we make a route by roughing it out, then zooming in to fine tune the settings of each waypoint… and then giving them a name, which is always an important step. Once underway, all waypoints have to be adjusted for conditions. 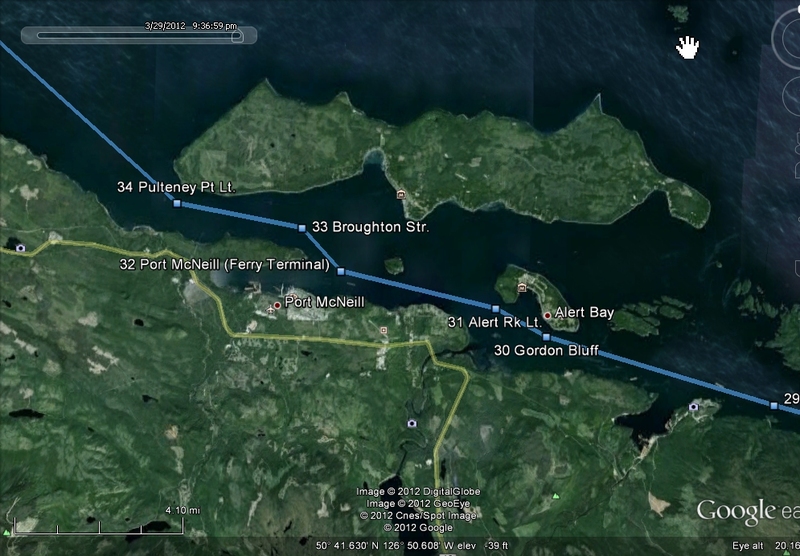 Night vs day, winds, and along this route the main factor is tidal current. Current can completely dominate what you do in many places. Some narrow passes here have very strong currents (ie 15 kts!). Gpx files will transfer between PC and Mac, as well as Andorid and iOS apps, and work with any browser. Then with a nice route laid out you can print out a Route Plan which is a hard copy to follow underway. Some ECS programs let you do this in steps, others only show the whole route, forcing you to break up the route to make pages for your Route Plan. So back to the gpx file, you may have one program you like for laying out the route, but another does a better job with the Route Plan pages. Just import the gpx route to the program you like and print the route pages from it.Below is a section of the first page of this output. This one is from Coastal Explorer, which has a nice route plan layout function. For a long trip, having a book or route legs (as opposed to just one large overview as shown here) is a great savings underway. That is, show the mini chart section above with the table below for a few legs at a time. Then you can print in color and put in a note book for the trip. Any one may have to be changed, but at least you have an organized starting point and you can paste the related tide and current data to the same pages when you know when you will be at each leg. I will make some samples for this route when i get a chance. Generally you do it by breaking the full route into shorter sections, and printing the route plan for the sections. To get the route into your smart phone, just email the gpx file to yourself then when it arrives you should have the option to Open with? at which point you chose the ECS app you want to use. With an iPhone you touch and hold the email attachment link to get this option. What you get will still be a surprise as the technology settles in. On an iPhone this works pretty well. MotionXGPS accepts it but interprets it as a track, but it looks good since they have charts for everywhere. iNavX does a nice job of receiving it and storing it as real waypoints and a route, but it will not look good unless you have Canadian charts installed. Likewise with Memory Map—imports nicely but without Canadian charts it is not very useful on their world map. Canadian charts are available for all apps. MotionXgps has the price advantage of providing their own charts, which can be cached so if you lose connection you can still navigate by gps with your phone. It is hard to feel sorry for Google, but the practice of Nabu Press does seem a bit over the line. They print and distribute old books that are no longer copyright protected ― which of itself could be a convenient service to have available. So I found by accident a book they published (Henry Wilberforce Clarke's Longitude by Lunar Distances) and ordered a copy, done as a matter of reading convenience, as i already had a pdf version that Google had distributed at no charge. And lo and behold, now I have too copies of this identical imprint. The Nabu folks simply removed the Google watermarks from the Google scanned pages and then printed and sold it (crooked pages, smeared sections, odd black marks, and all). There is no reference or acknowledgement to Google for the scanning and pdf production, not to mention the deception of removing the Google watermarks. It is unambiguously the same scan. There are a lot of us who ponder the pros and cons of the Google scheme of scanning all the books in the world and posting them. 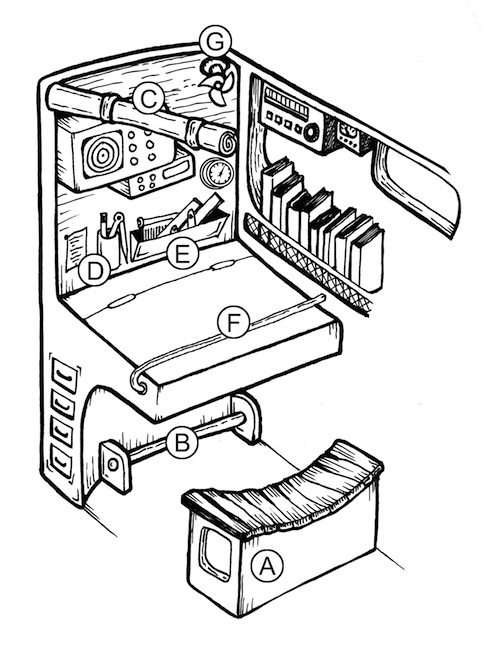 They also do this with many books that are still in copy protection. I am not sure if the final legal judgement has been settled. It is all too complex. As an author who must do research, these books are a blessing; as an author who finds his own books fully scanned online for free preview without any permission given, I am still uncertain. So now too we can ponder if this Nabu scheme is robbing the rich to give to the poor, or to give to those who are just not quite as rich ― or is it just "no honor among… whatever." A typical tidal current cycle goes from slack water to peak flow and back to slack water in some 4 to 7 hours, with the average being about 6 hours. To cover this variation, we divide the time interval from slack to peak into three equal time intervals, as shown in the figure. On a world average, the intervals would be about 1 hour each, but using thirds makes it more universal. Thus the Rule is the current rises from slack to 50% of its peak speed in the first third, then to 90% in the second third, and finally to its peak in the last third. 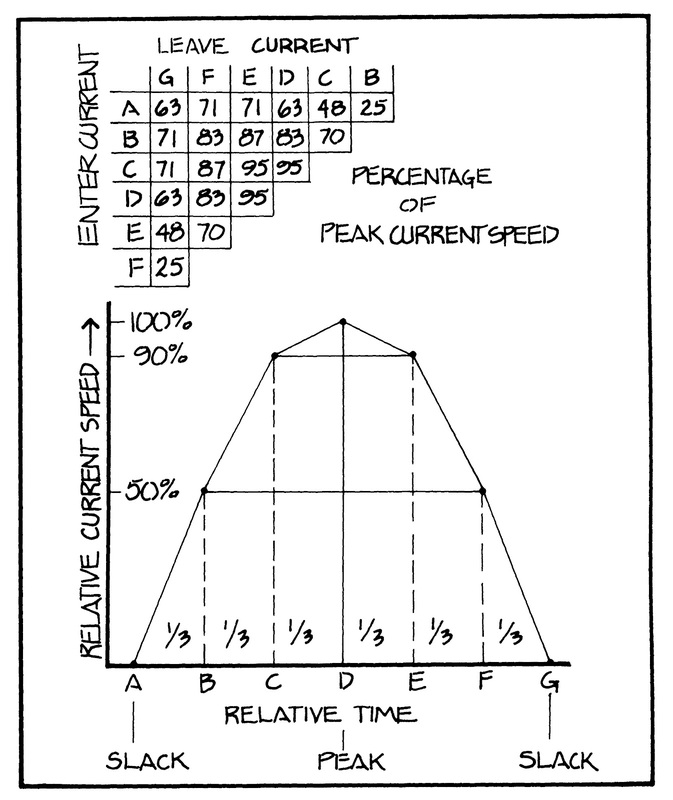 It is a way to approximate current speed at intermediate times for typical reversing tidal currents. The US Power Squadron has adopted this rule and offers work forms for applying it. 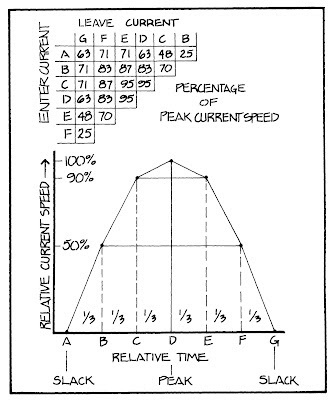 There are tables and diagrams in the NOAA Current Tables for figuring the intermediate speeds, but this rule is easier to remember and apply. Strong currents in very constricted passes can rise and fall more quickly than this (called a hydraulic head). Such currents are usually noted in the current tables with a special intermediate speed table. Starpath 50-90 Rule diagram. A typical reversing current cycle, which on average would be 6 hr long, with each letter marking a 1-hr interval. If the peak current were 3.0 kts, then 50% is 1.5 kts, and 90% is 2.7 kts, which would be the current speeds at 1 and 2 hr into the cycle from slack. The inset shows the effective average current entering and leaving at specific points in the cycle. Entering at C and leaving at F would mean you will be set by an amount that is equivalent to a constant current of 0.87 x the peak current. Entering at A and leaving at D would be as if you were in a steady current of 0.63 x peak, which is the same as riding through the full cycle A to G. In our example, we enter at B and leave at D for an effective average factor of 0.83.
peak values and time scales are likely different for successive cycles. Graphic from the book Inland and Coastal Navigation by David Burch. Can exceptional behavior be considered ordinary? The answer is Yes, according to Justice Wilmer in the 1955 case of Velox vs. Viking Monarch, wherein one anchored vessel dragged anchor and collided with another when both were sheltering from a severe storm, when there were maneuvers and procedures that might have avoided it if taken. "I have been reminded, and quite properly reminded, that no seaman can be called upon to exercise more than ordinary care (we add, see Rule 2a); but I think it is necessary to observe that when a seaman is called upon to face wholly exceptional conditions, ordinary care of itself necessarily demands that exceptional precautions may have to be taken." In other words, it is the ordinary practice of seaman to take exceptional precautions in exceptional conditions, just as it is to take normal precautions in normal conditions. Chart Sounding Datums… who needs um? I think the answer is no one, but the typical navigation text and reference publication would not be the place to learn that. There is no further clarifications of the terms in the booklet. There is definitely an implication here that we need to know what these chart datums are, but we do not. This type of presentation is just another way the government supports navigation schools. "Drying heights and contours above chart datum"
"Drying heights and contours above the water level when the tide height is 0." "Water depth when the tide = 0." In fact, there is no place in practical navigation where the navigator needs to know what tide level is being used for the chart datum. 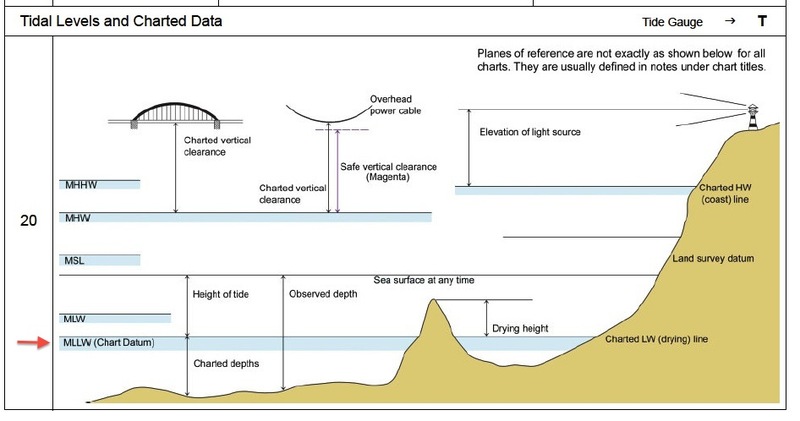 The depths printed on the chart (called soundings, because the numbers shown on the chart were actually measured at some point) are the expected depths of the water when the tide at that time and place is 0. If the chart reads 13 ft, and the tide is 4 ft at the moment, then we should expect the water to be 17 ft deep at that time. Put another way, we should always expect the water depth to be deeper than shown on the chart except in those short periods of time when there happens to be a negative tide. All nautical charts of all nations work this way. The chart datum used is actually some arbitrary level of the tide averaged over a long period, usually 19 years. On the US west coast where we have two highs and two lows each day and the two lows are not the same, NOAA uses the 19 year average of the water depth at the lower low of each day and they call that the depth of zero tide, labeled MLLW. The idea is get some reference plane that will make the tide positive most of the time. They could have done something more like the Canadians and decided not to use the lower lows every day, but just the lower lows on the days near the new moon and full moon. This would lead to even fewer days with negative tides. It really does not matter what they do, so long as the folks making the charts and the folks making the tide tables are still friends and working together. Beyond that the navigator really does not care. By the way, with all that said, I must add that this lack of concern does not apply to the vertical height datum used on charts. That is always Mean High Water (MHW) and it is crucial that we know and understand this concept. In fact, the nautical chart is the only place to learn the value of MHW. This crucial data (ie for predicting bridge clearances) is not available in tide tables. It can also vary from one part of the chart to another, in which case there would be multiple listings on the chart..
Several things will come to mind after a trip across the ocean in a small boat. First the seat. A curved one like this (A) is easy to build and then you are sitting up when heeled, but you still need the foot rest (B) so you can pin your thighs against the bottom of the chart table to stay in place. The idea of a bungee cord across the top of the table (F) was discovered as a last minute rule beater in an ocean race safety inspection, but turned out to be a great solution i use all the time now. It not only holds the chart table lid down but you can put books and charts or a laptop under it to hold them in place. To get into the table, just pull it aside. It would seem to be in the way, but it is not. Pencils and tools holders (D) and (E) are essential. We need our tools outside of the table where they are easily accessible. Put another way, make a rule that absolutely nothing goes in the nav station except your stuff. Then when it does fill to overflowing with random stuff from everyone, just forget about it. But most of all, do not depend on that space. Let folks use it for whatever they want. 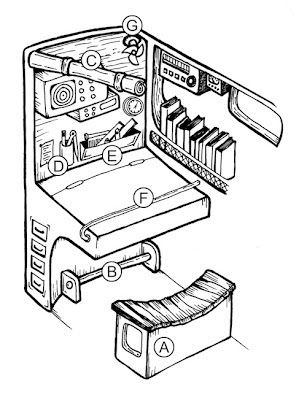 You won't be able to find what you need in there, not to mention the lid blocks the light when you lift it, which is a good reminder that you need to always have a pencil flashlight in the pencil holder for reading instruments at night and so on. A roll-up screen (C) is valuable for blocking the light at night and also for keeping the water off the chart table in rough conditions. I have seen one rig that had two, one transparent plastic, the other solid for night work. And a small fan (G) is a nice luxury in the tropics, since everyone else can be out on deck when the poor navigator has to sit at the table and work, sometimes in very hot conditions. Not shown is a set of head phones for listening to the radio without disturbing the rest of the crew. Very valuable… as is a piece of rubber non-skid for under the laptop. We have an extended article on the navigation station and its related tools and nuances in both our Celestial Navigation and our Inland and Coastal Navigation textbooks. Meteograms are graphic plots of hourly weather data. They can represent past data or forecasted data. A form of these are used by the NWS for their Hourly Weather Graph presentations that we discuss in the article War Horses and Secret Sources (which I will find and post here). For now we stress one valuable application, namely a study of the behavior of frontal passage. A meteogram is a perfect record of how everything changes as a front goes by. We can use this to predict what might happen when a front approaches us. These are forecasts, based on the NAM model. To use these, go to that link, then click the region of interest such as SE US as shown below. We will use that data to investigate the passage of a cold front over Alice Town, in the Bahamas. The surface analysis map we use was valid at 18z on Mar 4, 2012. The index map and an expanded map shows where the station is located. 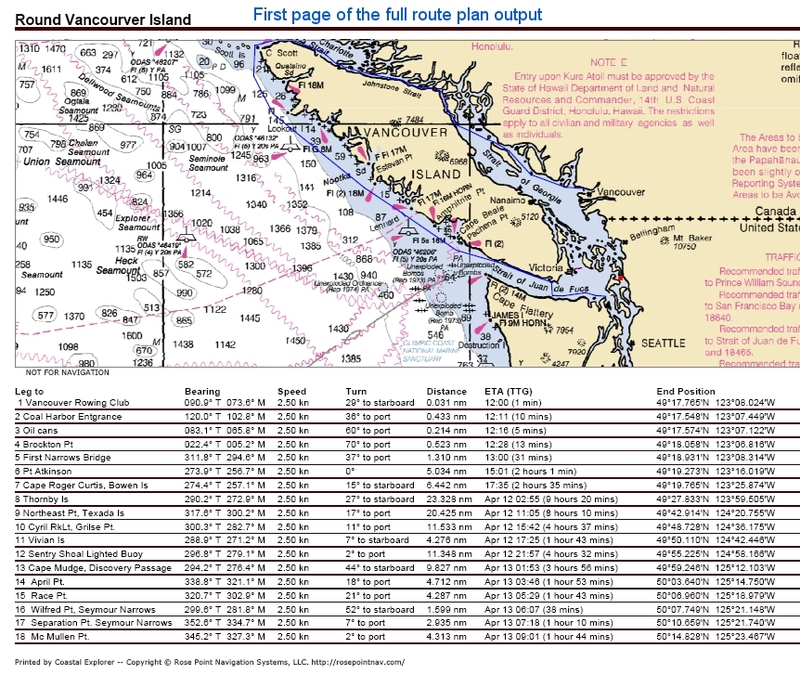 On the next page we see a section of the OPC marine map below, above the Unified Analysis (UA) map at the same time. The UA map is clearer for some analysis, but we get winds near Alice Town better from the OPC map. As a side note this shows how the UA maps can supplement the ocean maps in some cases. They are available every 3hr, whereas the marine maps are only every 6 hours. The meteogram forecast is shown below the map. Now the job is to study the data before and after the frontal passage to see how the various factors were expected to change. Look at the map first to make your predictions of what will happen, then look to the meteogram to see how this pans out. Before and after front passage (before /after). Check the map first to get your prediction, then compare with what the meteogram says, and then check too the station reports on the map. Meteograms are a great way to learn about forecasting and what to expect as certain systems pass over us. The hourly weather graphs mentioned above also show nicely when the air temp is expected to drop to the dew point, which is when fog will set in. For mariners or weather watchers in the Pacific NW, you can access the very nice meteograms at any location of your choice at the UW Atmospheric Sciences Make your own meteograms. These are output from their WRF-GFS model runs which should be more accurate data in principle than corresponding ones from the link above because they take into account the terrain and texture of the surfaces and other local factors. To study front passage and expected wind shifts (ie always a veer) check out our online course on Marine Weather. The books and software are also sold separately.